The garden going in May 12. Great weather for growing vegetables though. 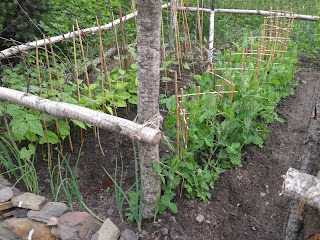 We put in a small veggie garden May 12 of this year and a small extension of transplants two weeks later. Today I thought it was about time that I gave an overview about what’s been happening. We moved to the country to start a new life the first week of March. One of the things we promised ourselves was to grow some of our own vegetables. We don’t have a lot of land so we had to be a bit stingy on how much room we gave things to grow. Luckily we do have sun. For the most part to seems that our amending of the soil with plenty of organic matter is working. We’ve got “action” on many fronts. 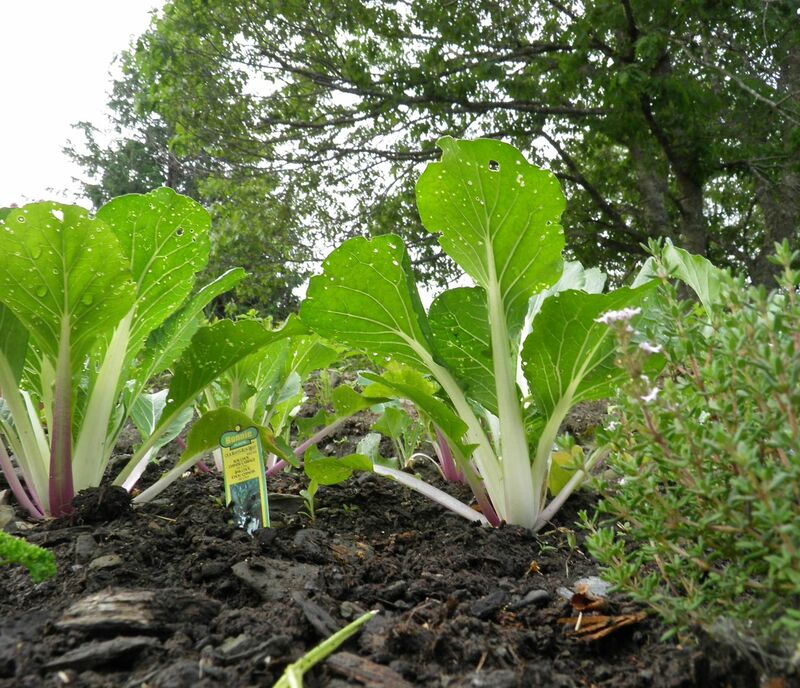 We planted a wide variety of vegetables that we hope will help us at least through to the fall. Some we’re harvesting now, some will be coming soon and others months later (or so we hope). Remember, this is only after 5 weeks from seed in the ground. I hope it serves as inspiration for anyone with only a little land in the country, or urban gardeners who want to try their hand at a little self-sufficiency. You don't need a "back 40 acres" to do this. 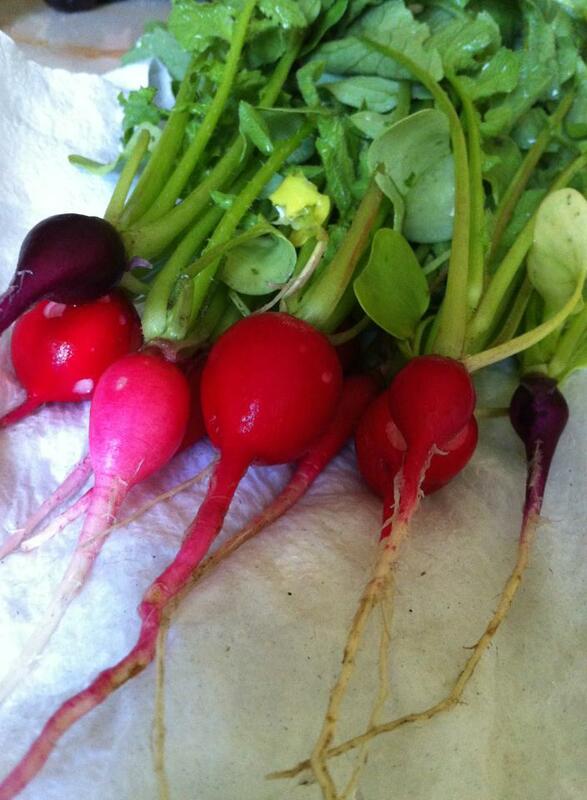 The first harvest that we had was radish greens. yes you can eat them. They’re great for a salad and are a little peppery. They were followed by mesclun greens (a mix of different salad greens) and radishes themselves two weeks ago. 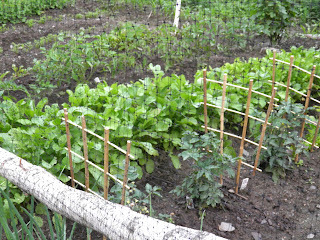 Our beans and peas are really starting to take off as are our tomatoes. Almost all the tomato plants are either blooming or will soon be. That’s good news as they like to ripen in the warm summer sun. Spinach (from seed 3 weeks ago) is starting to show true leaves as are the carrots. We sowed two kinds, the normal orange variety and purple ones. Basil from seed is a little slow but we didn’t have all that great a first half of June (wet and cool) so perhaps they will start growing better now. Something besides us has been enjoying the bok choy. Squash, beets, eggplant and cucumbers seem to have hit a bit of a slow down. Not sure if it was the recent cool weather or of they’re setting roots. I hope it’s the latter. We set transplants of romaine lettuce and bok choy that seem to have settled in nicely. Green Towers romaine is starting to live up to its name. 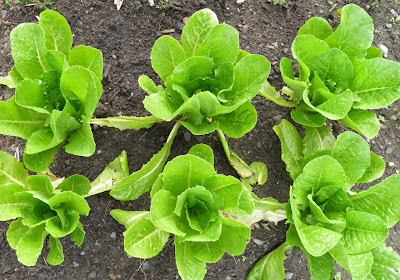 Interestingly they are only planted a few feet apart but it seems we are “sharing” the bok choy with the insects but not the romaine. Is it something we said? The perennial herbs have settled in and we hope they will grace us with a return next year. I have trimmed back the Italian and curly parsley already to use in the kitchen. It seems they were “inspired” by my threat. A lesson I did learn is to NOT buy basil plants early in the season. The cooler weather almost finished them off. Some are trying to come back from the base. That's why we planted seed. We want pesto! One thing that doesn’t seem to be doing very well is the dill from seed. Not sure of we didn’t amend the soil enough, if they’re slow starters or if it’s just been the weather. Time will tell. Something has been eating the haskap berries before we have had a chance to pick them. But that’s not too much of a disappointment. The bushes are small and we wouldn’t have had enough for “a feed” anyway! We’re newbies to all of this. When I was growing up I never really paid attention to my dad and his gardening, even though he used to put one in every year. Of course none of this includes the free bounty we have around us – those wild fruits and greens that go so unnoticed by most of us. One example is the rampant wild blueberries we have in our backyard. Another was the dandelions. They’re passed now. If you read up on wild edibles you will be surprised about what you find. Beans at left and peas on the right. 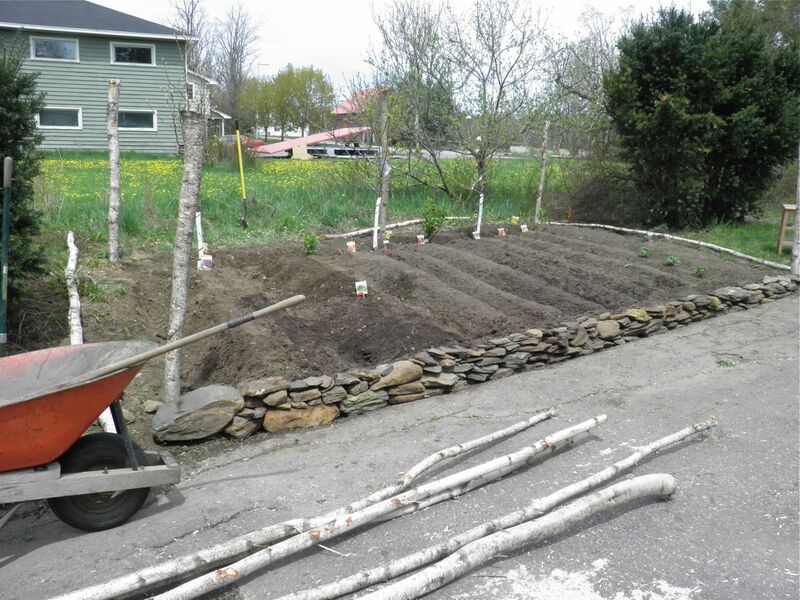 If you are interested in growing some of your own food, it may not be too late. If you start with transplants – still available at garden centres – you probably have enough time. It all depends on how much of your growing season is left. Just remember there’s some basics that vegetables need to reward you with a harvest: sun, water, warm temperatures, good soil and care. The only one you can’t control is the sun. The others are entirely up to you. Remember, if you buy transplants you’re ahead of the game, so if you want tomatoes or squash or whatever if you can find them at a garden centre it’s worth a try. They’ve already been growing for at least a month or two. 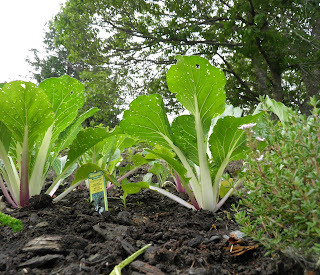 We’re hoping for two things from our gardening foray: vegetables and experience. That way we’ll be better prepared for continued success in the future. If our winter crops turn out I can see a post on how to build cold storage in the future. One must live in hope!